I did quite a bit of research before I embarked on restoring the windows, including attending a hands-on workshop to learn the process step by step. I blogged my decision on replacing v restoring in 2 parts, Part I at this link, and then Part II here. 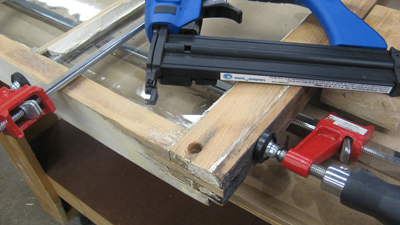 Restoring wood windows is a process. Although the total working hours are maybe 10 – 12 hours per window, its all the time in between that takes so long. I let a glue-up or epoxy repair sit overnight to cure completely. Oil primer takes several hours before it can be painted. The glazing putty takes a full week until it develops enough of a skin to be painted. And then 2 good coats of paint at that. And then another full week to let the paint fully cure before I put the window back together. So let me document my process. I learned a lot at a window restoration workshop, I’ve watched a ton of YouTube videos, and I even purchased a book from the Window Preservation Alliance. I should admit I didn’t follow the preservationists instructions to a T, but my goal was longevity and durability. My house isn’t going to be a museum. I don’t feel like I cut corners, but rather I made adjustments based on my past experience with furniture building & repair. First steps first. I removed the interior stop, the trim pieces on either side of the window that keep the bottom sash from wobbling in & out. 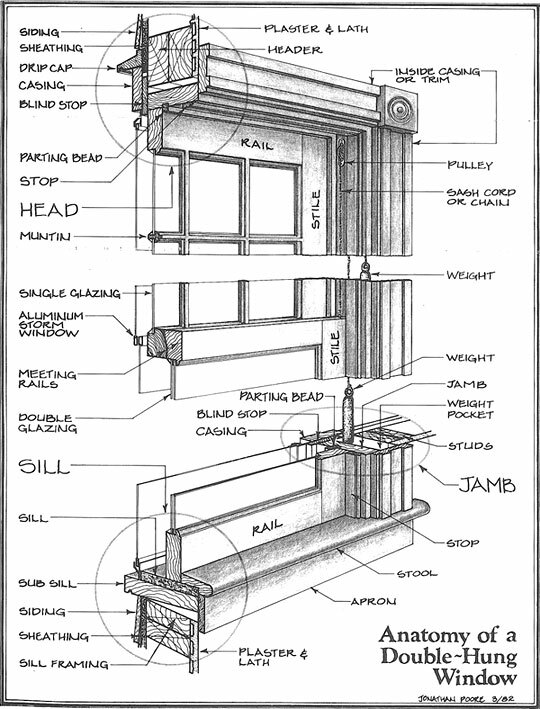 (Not defined above, the sash is the actual moving piece of the window that slides up and down. A double-hung window has 2 sashes, and upper and lower). 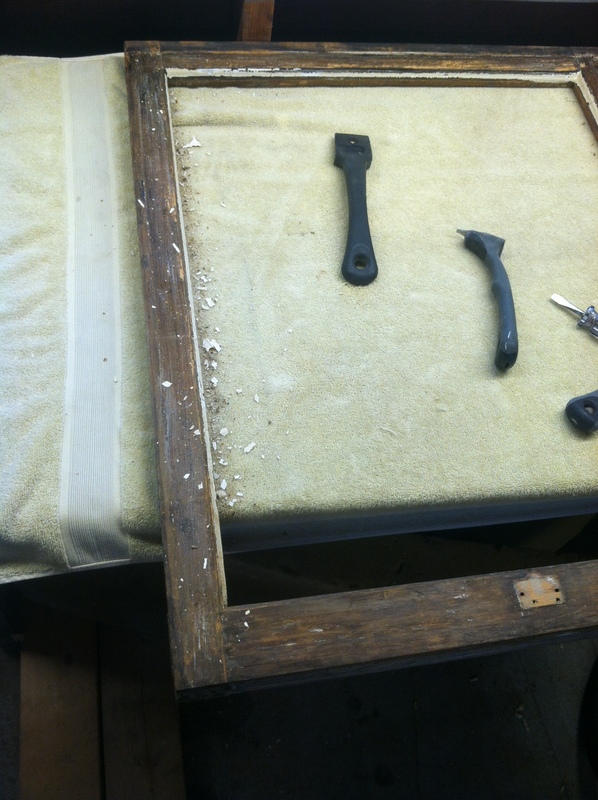 The interior stops are basically the only 2 pieces that keep the bottom sash in place, other than being connected on each side to the sash cord – or not, because I found that more than half of my windows have the sash cords disconnected. They were either cut or the knots came undone. More on re-connecting those later. The sash cords in my windows are only attached to the sash with a knot pressed tightly into a hole bored in the outside edge of each sash. Of the cords that were still connected, the knots pull out pretty easily, and I carefully let the weights pull the cord into the wall until stopped by the knot. If the knot was undone or too small, I pushed a nail through the cord to keep the cord from falling into the wall cavity. But I also removed the woodwork around several of my windows during the restoration process, either to better fix the already damaged plaster OR because the weight was already disconnected from the cord. Reconnecting the weights later is so much easier with the interior woodwork removed, but that takes patience and skill to not completely ruin the plaster. Next I carefully removed the parting bead, or as I call it parting stop. At first I was concerned about not breaking these pieces, but I later found that replacing this thin and pretty standard size piece of wood actually made my windows operate a lot better once reinstalled (I found new parting stop as a stock item at my local Ace Hardware). This piece is what separates the upper and lower sash as they slide up and down. Although they are supposed to be “tension fit” into place, I found most of mine had been nailed in place at some point, probably because they became loose over the decades. With the parting stop gone, the upper sash can now come out. 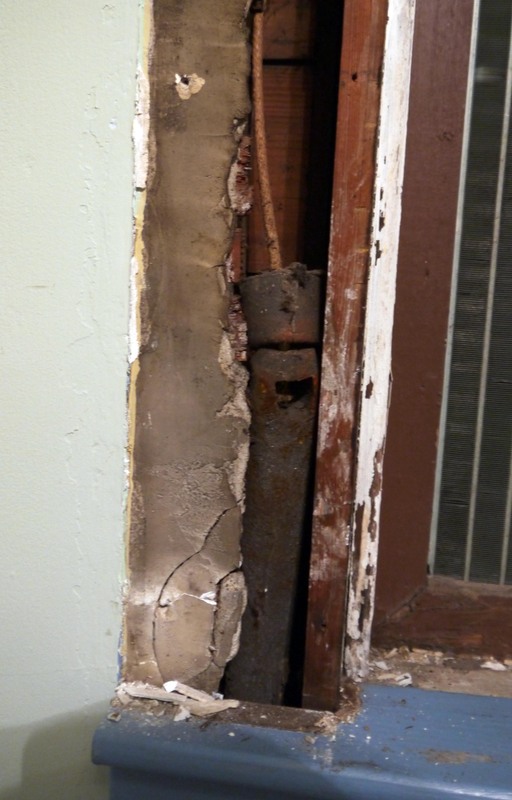 At this point it’s still fairly early in the morning on my typical “window Saturday,” so I would make a fresh cup of coffee and then begin scraping the paint on the outside of the window frame (but not drinking the coffee near the paint scraping – lead safety is a real thing). I haven’t restored any windows that have a storm in place, but otherwise these would have to be taken off at this point to fully scrape the outside trim. This way I could get the entire window frame scraped, removing nearly a 100 years worth of built up paint. I fill any major holes or cracks with wood epoxy, but I’ll worry with the small cracks and nail holes & sand right before I prime & paint. To secure my house, I simply cut a piece of plywood and screwed it into place to the outside of the window frame. For added “security” – I use that term loosely – I used star-bit screws so if someone tried to remove the plywood, they would have just a little more trouble trying to break in. Like, they’d have to make a trip to Ace Hardware to get the right bit and then come back to find I own very little worth stealing. So far I’ve worked on the windows at the back of my house, so they haven’t been very visible from the street. Next summer, however, I might work on a little better security so every car driving past doesn’t assume I’m an easy target. I’m refinishing my woodwork to it’s original stained color on the inside of the house, so I spend the time scraping the paint on the inside woodwork as well. I am much more careful on the inside trim because I don’t sand it down to bare wood; scraping the paint mostly removes the original varnish, but the wood keeps a lot of the stain color underneath. If I would sand the color completely out, it would be more difficult to achieve an even rich mahogany color when I re-stain it. I find staining over whatever color is left in the woodwork achieves a beautiful color that is spot on to the woodwork’s original color (seen in the few spots where the woodwork was not already painted). 04 is the window number (I numbered each window in my house, even with 2 windows tore apart it can get confusing). Ext means the exterior side of the glass. The first arrow (↓) tells me which sash (upper or lower), and the last arrow (↑) tells me “this side up,” meaning this is the top of the glass as it goes back into the sash. I know it’s old glass, but I find that Sharpie stays in place until I wash the glass with glass cleaner. It doesn’t accidentally rub off or fade while the sashes are being repaired & painted. Now the wood sashes in my windows have not been in great condition. Very loose joints and even some rotted corners where some idiot before me used nails & screws to keep the frame together. Originally the sashes would not have had glued corner joints. Each corner was made from a very tight tongue and mortise join, with two small metal pins nailed into place. But I use exterior wood glue and epoxy pretty liberally to make sure the joints are secure and the sash will last another century. In the sash above, I nailed 2 small brads to hold the joint along with the clamps, and then drilled a hole 3/4 of the way deep and glued a wood dowel into place. I haven’t yet had to do a “dutchman repair,” but there’s are several great online tutorials in case I find a spot rotted so badly that epoxy won’t cut it. Then it’s more scraping paint on both sides of the sash. I fill any remaining nail holes or cracks I find, then sand it smooth. This entry was posted on January 7, 2016, 11:15 PM and is filed under Home Improvement. You can follow any responses to this entry through RSS 2.0. You can leave a response, or trackback from your own site.